Whether you need help with those day to day tasks yourself, or you have a relative or friend who you think needs a hand, Fife Shopping & Support Services could be the answer. set up to provide frail and housebound elderly people and disabled adults in the community with support to maintain independence within their own homes. 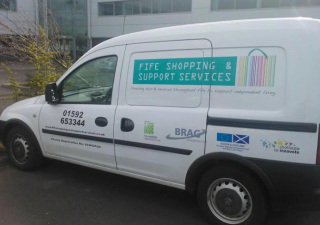 Fife Shopping & Support Services has been created following the closure of Fife Councils Shopping Delivery Service in September 2010. Any surplus profits that arise are used to develop the service and keep charges lower. Our purpose is to provide assistance to vulnerable elderly people and adults unable to carry out daily living activities and tasks. We currently provide services across Fife assisting with shopping, pension collections and housework and are developing new supports as client’s make individual requests. To fund the service we ask clients to pay a charge towards the costs of the service depending on the level of service they receive. As a registered charity we also raise funds through fundraising with the intention of keeping charges to clients as low as possible. As the number of clients using the service increases and funds are raised we will use the increased income to reduce the overall charges to all our clients. It is our intention that the service develops into a low cost provider to vulnerable people across Fife. Our managers and staff are checked with the police and other registered authorities to ensure they are fit people to provide services to vulnerable client’s in their homes providing clients with the assurance that they are in safe hands. Our experienced trained staff will visit your home to collect your shopping lists, cash and where applicable pension or other post office transaction documents and carry out your shopping and transactions returning shopping, change, cash and receipts the same day. We also help with housework where it is requested. The Company is a non profit service provider and Registered Scottish Charity. First registered as a Company Limited by Guarantee on the 25/08/2010 and registered as a Scottish Charity. I am really grateful for the shopping service. It is brilliant having a lady who is such a capable person using her initiative in what shopping is needed. She deals with the cash in a very professional manner, she is very reliable and keeps me informed if there are any issues developing with my aunt. The Company is a non profit service provider and Registered Scottish Charity. First registered as a Company Limited by Guarantee on the 25/08/2010 and registered as a Scottish Charity.